I just came back from vacation and I totally forgot the administrator password to log into Windows 7 on my new laptop. I am the only account set up and cannot remember the login. Is there any way to unlock my computer by recovering or resetting the Windows login password? Forgot your Windows administrator password and can’t bypass the logon screen? Have you tried all possible passwords but the login dialog keeps saying that you’ve entered a wrong password? It is really frustrated if you’ve lost your Windows password. Some users have gone as far as reformatting their hard drives and reinstalling the operating system, simply because of a forgotten password. In most cases, it’s not necessary to go to such extremes. You can regain access to your computer in a number of ways. In this tutorial we’ll show you several well-known methods which you can use to reset lost administrator password from Windows login screeen. Start your computer and when you see Windows Welcome screen / login screen, press ctrl + alt + del key combination twice and it’ll show you the Classic Login box. Type Administrator in Username and leave Password field blank. Press Enter and you should be able to log in to Windows. Now you can reset your account password by accessing the Control Panel -> User Accounts. You can also log in to the hidden administrator account from Safe Mode. In Safe Mode Windows will show this hidden Administrator account on the login screen. Once you’ve typed the wrong password in the login screen, Windows will show a “Reset password” link below the login box. Make sure you already have the password reset disk inserted at this point, then click on the “Reset password” link. Follow the instructions in the Password Reset wizard. This will allow you to create a new password. After that you should be able to log in to Windows with the new password. You can use the same password reset disk any time you need to reset your lost admin password. If the methods above can’t help you out, the last resort is to use a bootable password cracking CD to reset your lost Windows user password. Reset Windows Password is a recovery utility which runs from a bootable CD/USB drive and enables you to reset forgotten Windows 8/7/Vista/XP admin password easily. Here we’ll explain how to create a bootable CD and then use it to reset your password. Download the Reset Windows Password utility on an alternate PC. Unzip the download file which contains a bootable ISO image. Burn the ISO image to an empty CD using ISO2Disc, BurnCDCC or ImgBurn software. Boot your locked computer from the boot CD, then wait for the OS inside the CD to load. After the Reset Windows Password program opens up, choose your administrator account and then click on “Reset Password” button. It will remove your lost admin password in no time. Remove the boot CD and restart your computer. When you reach the Windows login screen, left the password blank and you can then log in to your administrator account successfully. If you have lost and forgotten login password of your Windows computer, but you can still log in to the system when automatic logon is enabled, then there are two ways you can recover Windows login password. The first option is to use Ophcrack. This is a Windows password cracking tool that reads the NT/LM hashed (encrypted) copies of the passwords from the system, and then uses dictionary and/or brute force methods to find the password that matches the hash. The stronger the password (the longer it is, whether it uses random letters and numbers or words and names) the longer this will take. 1. Download the zip archive of Reset Windows Password utility to an alternative computer. Once you download the zip file, just unzip it and burn the ResetWindowsPwd.iso file to a blank CD or USB flash drive using ISO2Disc. 2. Insert the bootable CD/USB drive into the target computer with a forgotten administrator password. Power on the computer and set it to boot from CD or USB, not your local hard drive. 3. Shortly after loading the operating system inside the CD/USB drive, it will launch the Reset Windows Password program. You’ll see the Windows SAM registry hive and a list of Windows user accounts which are detected by the program. 4. Choose a user account and then click on Reset Password button, it will remove your Windows login password immediately. 5. Remove the bootable CD or USB drive. Restart the computer and you can then log in to Windows with a blank password. 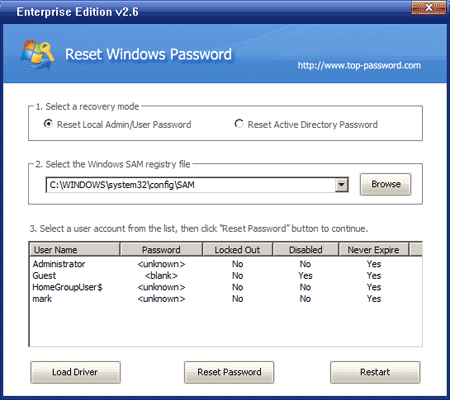 With Reset Windows Password utility you can easily recover Windows login password for Windows 8/7/Vista/XP and Windows Server 2008/2003/2000. Forgot the login password in Windows 7/Vista/XP? There a couple of different approaches you can take to recover access to your computer, depending on your exact situation. In any event you have two basic choices: you must either crack the login password or forcefully reset it to something known. It seems obvious to me that resetting the password will take much less time that brute force cracking, so it’s a more cost effective way to get around the password forgotten problem. Reset Windows Password is the powerful password reset bootdisk which comes with the ability of resetting login password in Windows 7/Vista/XP. Using the boot disk to remove a login password is much easier than re-installing Windows. No need to take your PC to a computer repair shop or call a technician to your home to fix the issue for you. You can reset forgotten Windows login password on your own. How to Reset Login Password in Windows 7/Vista/XP? Download the zip archive of Reset Windows Password utility to an alternative computer. Once you download the zip file, just unzip it and burn the ResetWindowsPwd.iso file to a blank CD or USB flash drive using ISO2Disc. Insert the bootdisk you’ve created into the target computer whose login password you want to reset. Power on the computer and set it to boot from your bootdisk instead of the local hard drive. Shortly after loading the operating system inside the bootdisk, it will open up the Reset Windows Password program. You’ll see the Windows SAM registry hive and a list of Windows user accounts which are detected by the program. Choose a user account and then click on Reset Password button, it will reset your login password immediately. The last step is remove the bootdisk and restart the computer. You’ll find that you can log in to your desired account with a blank password. Additionally, you can use the same bootdisk to reset login password for domain user accounts in Windows Server 2008/2003/2000. I think every system/network administrators should have a copy of the password reset bootdisk in their toolbox. Hi there, so you forgot Windows login password on your computer, and now you are wondering how to reset it? You are in the right place, and to comfort you up a little bit, you are not unique on this matter. There are a lot of people that for some reason forget the login password on their computers, and most of the time the answer they find all over the Internet is to reformat the hard drive, and reinstall windows. This is not the answer you will get here. So today I will share with you how to reset Windows login password on any computer running Windows 7/Vista/XP – the easy way. Let’s proceed. Choose a user account and then click Reset Password button. It will remove your forgotten Windows login password instantly. Restart your computer in normal mode and eject the CD. Now you should be able to log in to your Windows user account without entering a password. The procedure is very simple that even computer novices can follow to reset Windows login password on Windows 7/Vista/XP. Never need to worry about losing your important files when you forgot Windows login password.